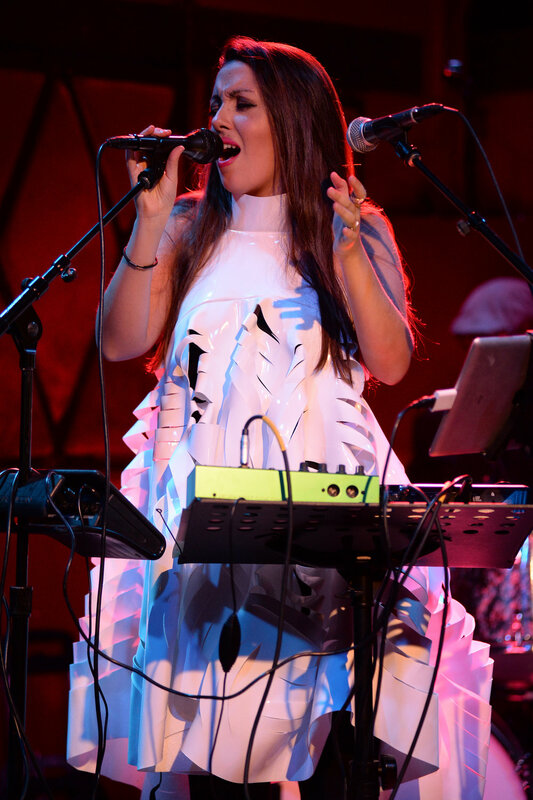 New York/Venezuelan experimental musician, Xi.me.na Borges is an extremely eclectic songwriter. Armed with an array of digital and analogue technologies, Xi.me.na uses her voice to blend the music of disparate times and places, creating alluring sonic collages all in real time. Daughter of one of Venezuela’s most prominent visual artists, Ximena went on to study at the Manhattan School of Music. A gifted musician since her youth, Ximena was already poised for professional stardom upon completion of her classical training. In 2012, she began to break away from the traditional technical approach of operatic singing to explore the range of sounds she could create with her voice. In November 2013 she released “Joyful Noise” with multi-award winning producer and Grammy nominated musician Gonzalo Grau. Ximena simulated all instruments on “Joyful Noise” with the creative use of her vocals. Her Kickstarter campaign (http://goo.gl/JBiUsc) in support of the release was fully funded, with 139 backers and over $12,000 raised. IX Daily called it “the most innovative Christmas album of the year” and Neufutur Magazine “This is the best holiday-themed album that we have happened upon so far this year”. Since then under the name XI.ME.NA, she has been performing using only her voice and electronic instruments to create the music. She performs in five different languages with original songs, jazz standards, and covers arranged in a unique and contemporary way for her voice and looper. 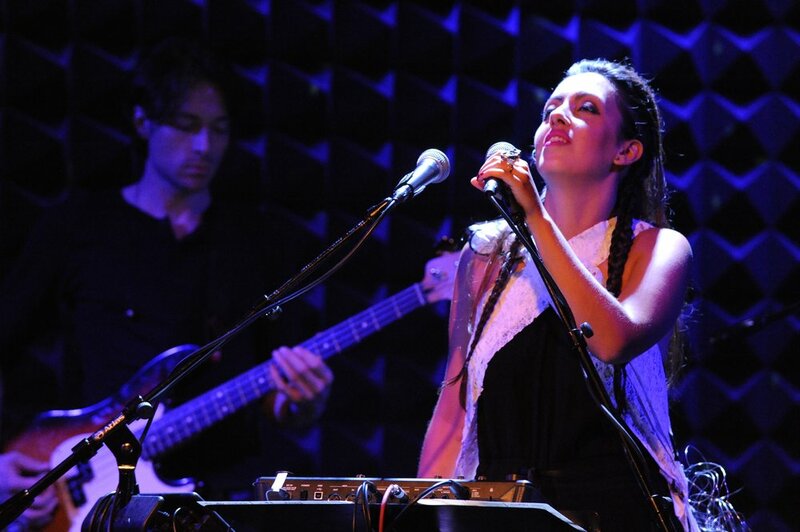 XI.ME.NA and her band have performed in New York, Brooklyn, Caracas, Valencia, and Berlin. XI.ME.NA is coming off the heels of working on a new project, Rocktopia, a symphonic rock concert recorded at The Budapest Opera House, which began airing on PBS in the fall. XI.ME.NA just finished touring with Rocktopia in 20 cities, 11 states, 7,775 miles on 2 buses and 1 truck, 10 Rocktopians, 6 crew, 1 management, over 400 local orchestral players and 450 local choral singers. Simultaneously, XI.ME.NA has finished recording an exciting new album of original songs, 4 of which are available on her EP Corners on Spotify, iTunes, Amazon, CDBaby. A medio camino entre lo academico, lo popular y las posibilidades de lo electronico. Halfway in between the academic, the popular and the posibilities of the electronic. Para describir a Ximena Borges, habria que hacer la equivalencia de Ximena con una suma Isabel Palacios + Tracy Chapman + Lady Gaga en Venezuela, con esa suerte de propuesta posmoderna y universal que no sufre complejos por vanguardista. To describe Ximena Borges, we would have to say she is a sum of Isabel Palacios + Tracy Champman + Lady Gaga in Venezuela, with that kind of postmodern and universal proposal that defies vanguardist complexes. Llamaba la atención que estuviese sola en el escenario, acompañada únicamente de dos micrófonos. Porque la voz es su único instrumento. Ximena Borges emite sonidos que son filtrados por un sintetizador, con los que hace loops, sobre los cuales canta. Luego de su primera canción, se quitó el sombrero y rompió el hielo diciendo “seguramente ya estoy despelucada”. The Next Big Thing: Ximena Borges "Joyful Noise"
This collection of acapella X-mas songs from around the world, straying from the more conventional versions, with the exception of “Amazing Grace”. Not only is this exotic siren hot enough to melt frosty, but Ximena is also an opera singer based out of New York, who funded this album through a Kickstarter campaign, so was pretty passionate about making this happen. Her opera back ground gives her the chops to throw her voice around any way she pleases to get the job done. Recently, Ximena Borges has stepped into this universal web of Christmas song cornucopia with her new album Joyful Noise. Some of her songs are very spiritual, and some are sassy. She does it acapella — one voice, one body, five languages. It is mind-boggling how Ximena gets so many sounds from her own body, but she does magnificently enchant by snapping her fingers, clapping her hands, pounding her chest, whistling, rolling her tongue just to name a few sound maneuvers. Around this time of year, hundreds of Christmas albums come out, many of which feature the same few dozen songs in some manner shape or form. Ximena Borges, who describes herself in her bio as "One Voice. One Body. No Instruments," makes good on that promise as she expertly layers her own voice to put together Joyful Noise, easily the most innovative Christmas album of the year. Featuring Christmas standards as "Amazing Grace," "Niño Lindo" and "Christmastime Is Here," Borges also uses some atypical arrangements on other Christmas songs to make them wholly her own. There are very few holiday albums that look to do anything special. Joyful Noise is an album that will shatter all conceptions that listeners will have about holiday music. The album begins with Crunchy Drummer Boy, a much more eclectic and bouncy version of the classic Christmas track. The music here does come from left field, but it is done in a fashion that is absolutely catchy and hard to forget. I’m generally leery of Christmas-themed albums (not even my belovedNick Lowe can escape some form of my immediate cynicism), but it being the Holiday season I should at least attempt to review one festive-inclined offering. Ximena Borges’ Joyful Noise is an entirely a capella Christmas album, but in no way is this your parents’ dusty CD of Gregorian Chants. Joyful Noise is an immensely enjoyable experimental album in five different languages that utilizes the voice and the voice only to bring a different spin on the Christmas album. 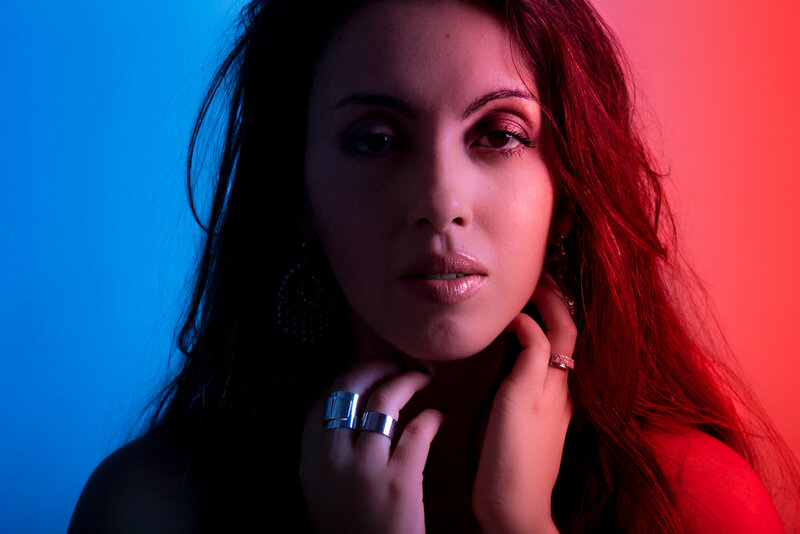 Album review: Ximena Borges "Joyful Noise"
She has a great voice and her experimentations with it paid off in this passion project . It is worth your time, if the normal X-mas fare doesn't cut it for you. I normally hate X-mas music so for her to sway me is a testament to what she has crafted. Las canciones que componen el primer trabajo de Borges fueron grabadas sin instrumentos: los sonidos emanaron de las cuerdas vocales de la soprano y de un computador. Son temas lúdicos interpretados en cinco idiomas: inglés, español, italiano, alemán y francés. La cantante lírica unió su talento al del músico, arreglista y productor venezolano Gonzalo Grau (nominado al Premio Grammy), para grabar diez de las más populares canciones de navidad de distintos países en 5 idiomas. Un disco de navidad con arreglos inusuales en el que su sola voz se convierte en decenas de voces e instrumentos. El álbum -que fue financiado por usuarios de Internet- salió literalmente del armario de la joven cantante lírica.